I've always, always wanted a pair of those big concrete lions for my front porch. Until I find them some day, I came across these little guys at Home Goods that I couldn't resist. They got a new paint job, of course. I recycled the pots that I used on my Christmas Mantle and made a little faux orchid arrangement in them for Spring. I moved the black dresser that used to be between the leather recliners over to a blank spot next to the bar. I've always felt like that spot was a little bare. For Like Ever was there for a while, but I've actually changed up the artwork there since this photo. I'm using that one in my bedroom at some point. 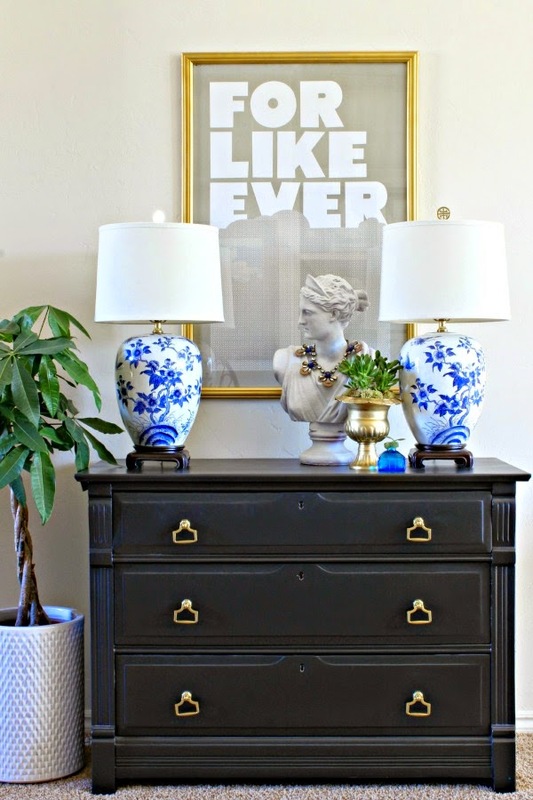 I also took the opportunity to bring in a pair of blue and white lamps that I've been using in the bedroom (vintage Ethan Allen Craigslist find- yay!). In place of the dresser, I used my new-to-me sofa table. I'm liking the shallower but longer footprint between the chairs, and the baskets underneath are good storage for the newspaper, magazines, and throw blankets. Last summer I shared with my Instafriends this fabulous drapery panel that I found while thrifting, and I finally got it turned into some new pillows. I wish I new something about the fabric. I've never seen it before but it's really good! One other fun new addition, I scored this brass tray table from CL right after Christmas. The base was wood and really pretty, but not spectacular. I tried painting it white, but it just didn't work. On to old faithful... Meadow Green! I'm in love with this little corner now, although I plan for that table to eventually end up in my Master Bedroom (makeover plans in the works!). I also needed some fresh photos for another reason, which I can't wait to share with you tomorrow! I'll be posting at a different time than normal, so I'll share my amazing news with you tomorrow evening (hint, it might just rhyme with Moss & Jane!!!). Hope to see you then! P.S. Did you notice anything different? I've been tinkering with my blog design a little bit. I still have a couple of things that will change in the next few days, but I kinda love the new look. Colorful... stripes... black and white... it feels like ME! Hope you like it too! Everything is so beautiful. I love your colors and your style. 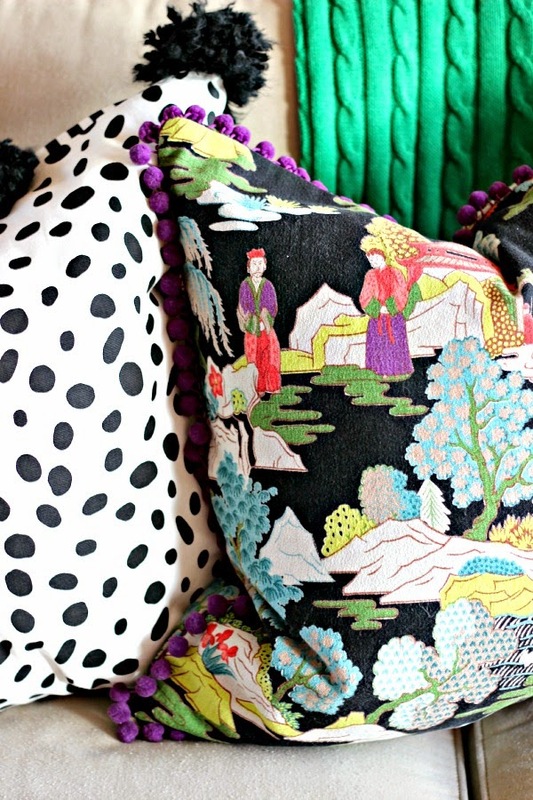 Great new pillow and the fabric really is stunning. I also like the new header, it does look like you. 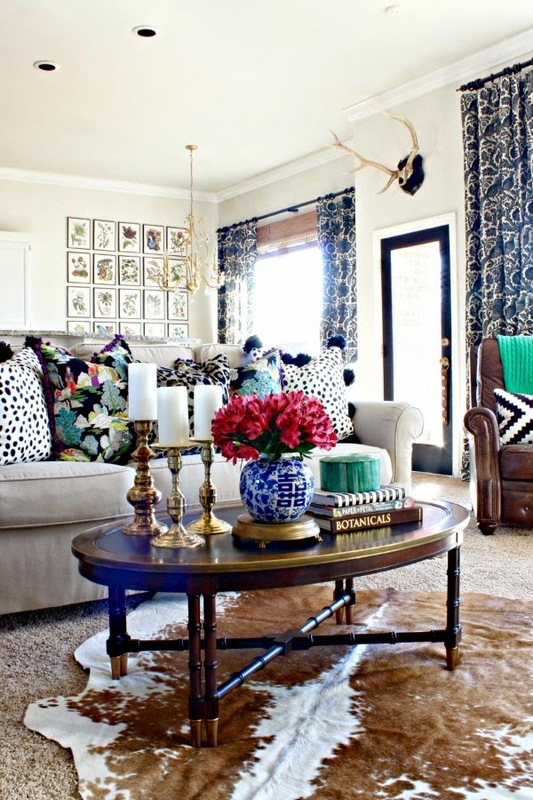 I really love how you have mixed the different patterns on the sofa. 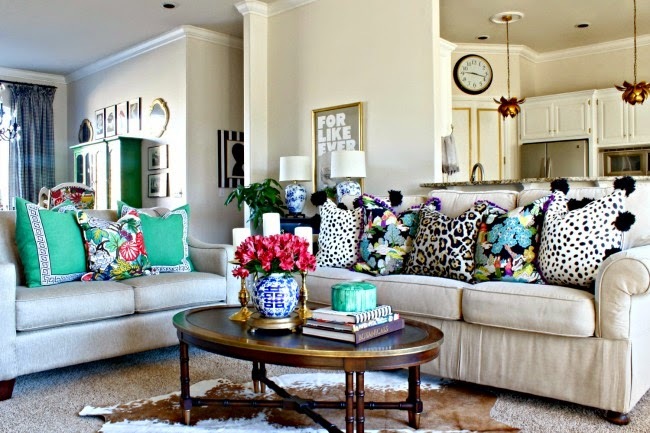 The pillows come to life and make the space look vibrant. The space looks beautiful. Love your header. Everything looks beautiful. And I also have always wanted big lions on my front porch and the reason for that is that where I am from In Germany has a big Bavarian lion. It makes me think of home. Adore the new header! It really DOES look more "you" than before haha. 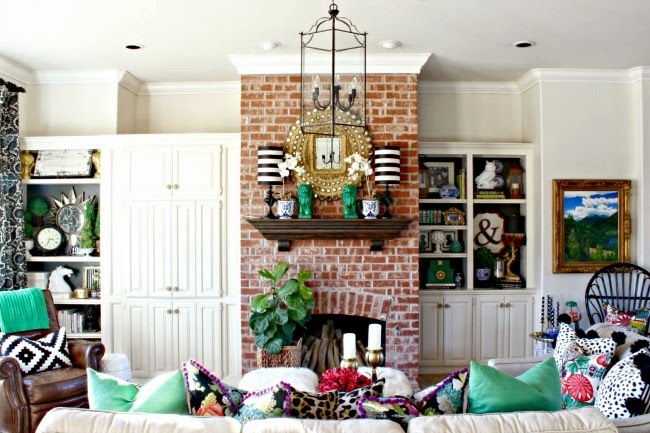 I also may want to steal those green lions if you wouldn't notice ;0) Your home is just lovely. Can't wait to read your big news tomorrow! i love how you keep things so fresh! and LOVE the header and the look! What a beautiful room, so full of life and color. Love the new header! Love your space! Where is your coffee table from? Your blog header is SO you! Thank you Anna, it's fun to have a new little accessory to mix in. Hope you have a great day! Thank you Angela, I agree! I love your new header, I noticed it right away and yes - it is so you!! The new pillow fabric is just gorgeous, love the purple pom pom trim.....all your colorful accents look so fun against the neutral backdrop!!! VERY excited about your big announcement tomorrow - wow!! - can't wait to hear more!!!!! 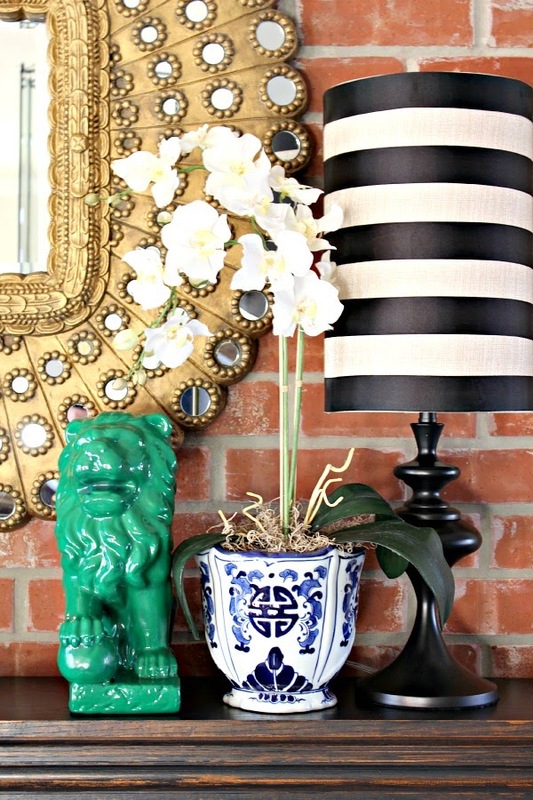 Your home is just full of so many eye-candy Jennifer! I want to go shopping in it!!! Love it, perfect for the dreary days of winter. 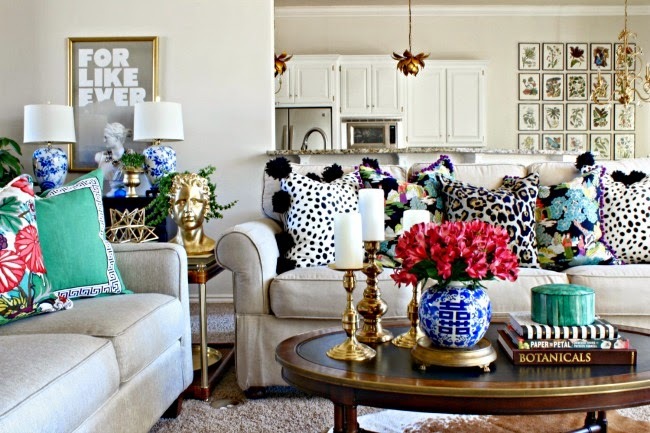 LOVE your new header Jennifer and all the pretty changes you made to your living room! Cozy, colorful, and beautiful! I really like the light painted gold! Hi! Where did you buy your green throw blanket? Thanks! Hi Robin, that was a HomeGoods find from last summer/fall. It's Ralph Lauren if that helps any. Thanks for reading! I'm sure you've mentioned this somewhere on your blog, but what is the name of the "gold" paint (spray or otherwise) that you use on some of your pieces? I love all the bust you have! Where did you get them? I have been on the hunt but they are expensive. I would also love to see a close up picture of your built ins! Love, love, love your style! I love the changes and the new photos look great! I always wonder when reading blogs how the layout of the rooms fit together, and you showed us! Looking forward to tomorrows post--Congratulations! By the way where did you get the gold frame for For Like Ever? Love the refresh Jennifer. I just saw those lions today at home goods. I didn't pick it up since I didn't like the color. I definetely like how you painted it green. So much better! Thanks for sharing and oooooh my the excitement for tomorrow's news!! I love "Moss and Jane"
First of all, I love the new header! I mean love! It's awesome! And your house is fabulous - it's so fun to see whole room shots of it when it's usually just pieces here and there with blogging. And that big news is beyond amazing!!!!! 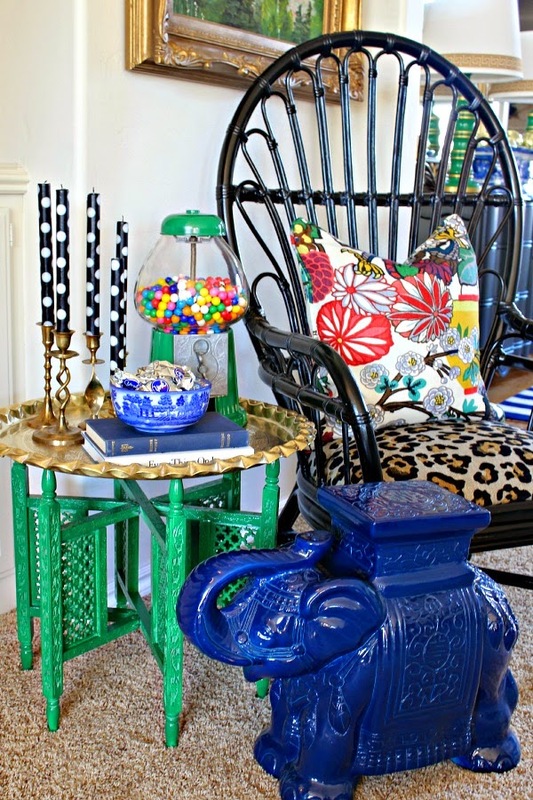 I love your style of decorating, especially the bold colors you use. I especially enjoy seeing how you decorate your mantle. Have a wonderful week, Jennifer. I love your living room! So colorful and pretty! So many wonderful details! 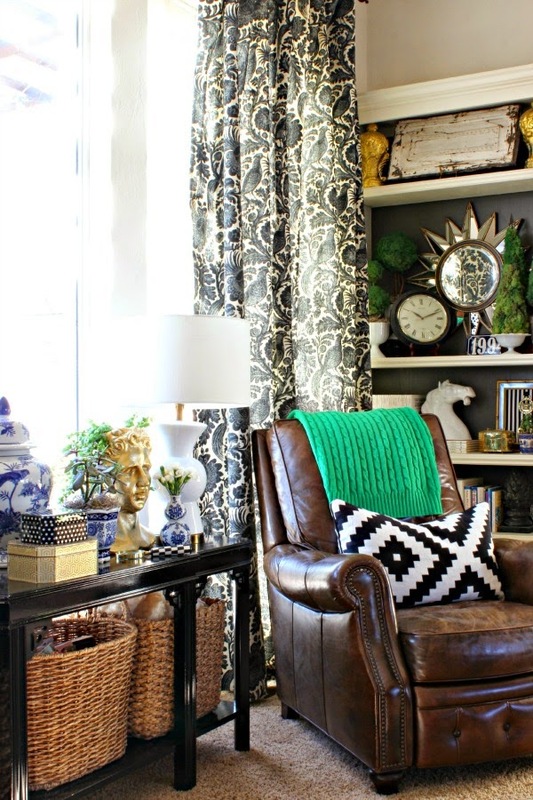 I love seeing your space, and love how you layer patterns and color! Everything looks bright and beautiful! You do have the best luck with CL finds and thrifting! 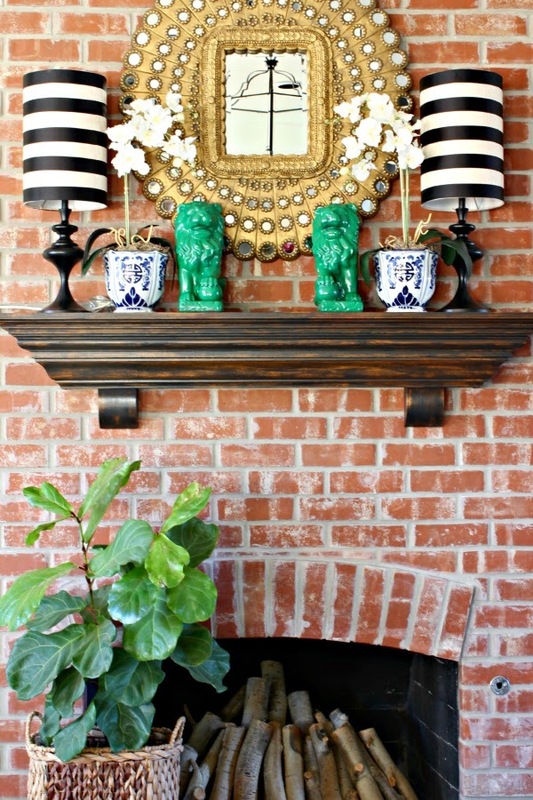 :) I did notice the new touches on your blog ~ love! You always do such a lovely job on this space. It brings a smile to my face. Jennifer, I'm sort of new to your blog (love it! ), and I'm wondering about the storage on either side of your fireplace. Are these pieces you installed and integrated into the wall, or are those custom cabinets? We are thinking of dressing up our study a little bit, and some of the storage needs to be hidden...not straight bookshelves. Thanks, love the study as well. My hubby also was in the ministry, and there are ALways books! Your pillow fabric is 1940's bark cloth made by Markwood Fabrics. It's called Chippendale and was made in different colorways. Where did you get your green pillows on the couch? I love them with the leopard which I just ordered from Etsy. Thanks!